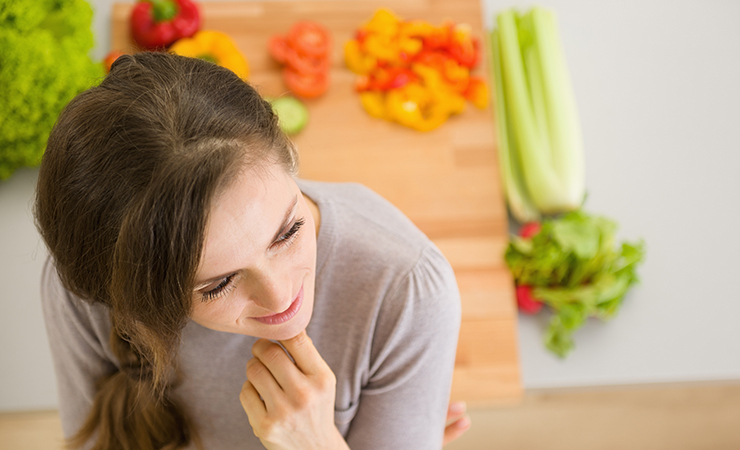 Rather than focusing just on what we eat, mindful eating also looks at how we eat it. It is about being curious about tastes, smells and textures. It is about paying attention to your food, and to your body’s reaction to that food. Think about our North American eating culture; we drink giant coffees and quick meals from a drive through never leaving our cars. We don’t give ourselves the opportunity to sit down and eat our food without distraction. We prioritise cost and convenience, rather than quality, nutrition, and the environment in which we eat. Compare this to France, so well-known for the “French Paradox” – the idea that the French can eat high fat food, drink red wine, and somehow enjoy a longer and more disease-free life than their North American counterparts. Our scientific minds, looking for a single answer, have us looking at a single component of this diet. It must be the red wine, or even better, the resveratrol within the red wine. What if it had more to do with their long lunches, eaten at a table surrounded by others or savouring each bite? This idea is also now being backed by research. Mindful eating habits can help improve eating behaviours, and support healthy weight loss and blood sugar levels. People who eat mindfully are better able to listen to their body’s satiety cues. There is also a focus on increased self-compassion, and less of the guilt and shame surrounding food and eating. 1.) Pay attention to your food. Implement just one meal each day where you sit down and really pay attention to your food. While preparing pay attention to the smell and colour and think about how delicious it will taste. Get your mouth watering before you sit down to your meal. This reaction, the Cephalic Phase, is a key part of our digestive processes. The thought, sight, and smell of food triggers appetite, as well as oral and gastric secretions, which prepares our stomach for the arrival of food. When we allow this reaction to take place we digest our food better, feel more satisfied, and have fewer digestive problems. 2.) Listen to your body. Ask yourself this simple question before you start to eat: Am I hungry? And then, without judging yourself, decide whether or not you want to eat. Half way through your meal, put your fork down and take a deep breath. Ask yourself if you are still hungry. Many of us have been taught to ‘clean our plates’ regardless of whether we are still hungry or not, instead eat until you are satisfied. Taking a deep breath sends a signal to your body that you are safe, and takes your body out of “fight or flight”, and back into “rest and digest” mode. When we eat on the run or when we are stressed, blood is diverted away from our digestive system and into our muscles so that we can react quickly to whatever is threatening us. It puts digestion on the back burner and can cause bloating, indigestion, and erratic blood sugar levels. Try taking 5 deep breaths before you begin to eat. Your digestion and your stress levels will thank you!